“Spectacular,” “Stunning views,” “Incredible,” “Private,” “Peaceful,” and “Secluded” were just some of the enthusiastic statements which I heard numerous times when I held a Broker Open House last week to preview the Hale Ku Mana estate, a Hualalai Resort home for sale ensconced by a private golf course. 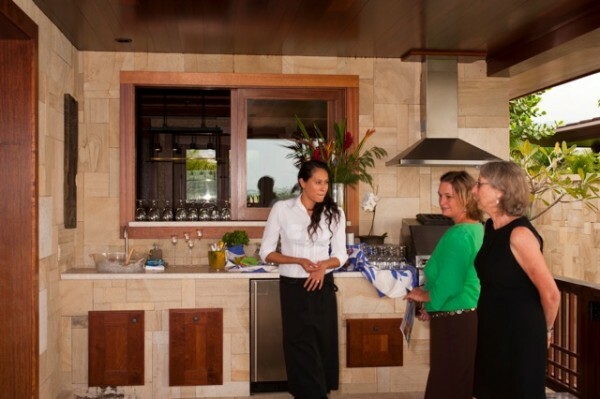 The guests, who were treated to pineapple cocktails and gourmet appetizers, included Realtors and the key people who helped design, build, and decorate this $13.5 million dollar “island within an island” home at the Hualalai Resort on the Big Island of Hawaii. 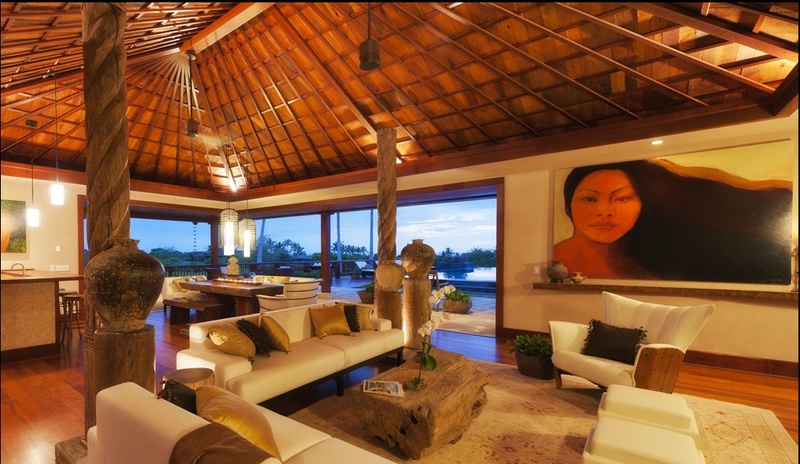 The guests mingled in the ample entertaining areas around the courtyard, infinity pool, the numerous lanais and grand living room, while viewing artwork created specifically for the home. Artists include Helen Turley, CF’s mother, Sue Graham of London and local artist, Patrick Rankin of Hawi. Patrick explained the stories behind his original Hawaiian paintings to the guests, one of which is a Hawaiian woman, a focal art piece on the wall in the living room. 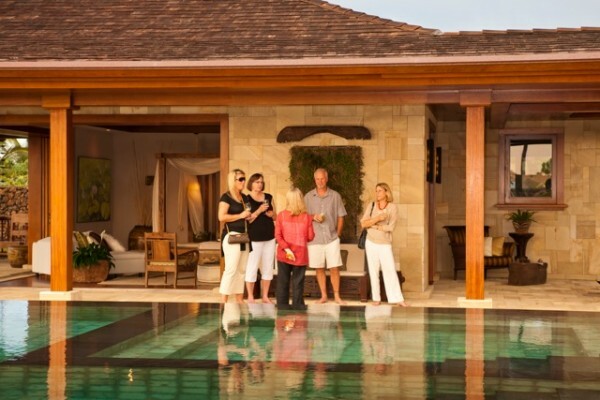 Private tours were given of the innovative and hand crafted estate before the sun set so the guests could experience the golden glow cast upon the home and on the numerous reflecting pools around the property. The builder and interior designer for the estate, CF Turley III, mingled with the guests and told the story of how he and his partner had an original design and vision for the home, but then took an architecturally inspirational trip to Bali and Southeast Asia before the home was built. 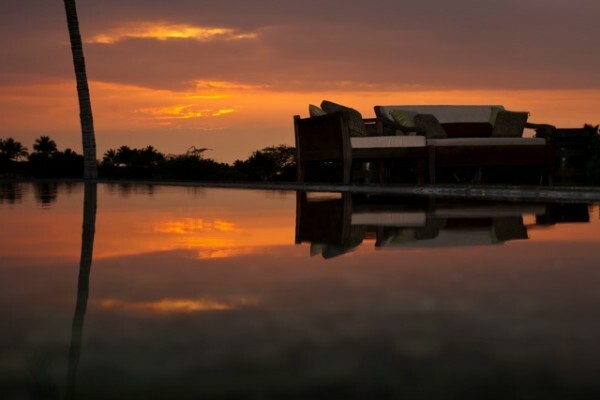 What they discovered in Bali convinced them to completely alter the plans for the estate. They loved the open-air bedrooms with seemingly floating elements in the bathrooms with vaulted ceilings and furnishings that created a sense of a sanctuary within each home. They incorporated their inspiration into a brand new Balinese styled design for the estate, which has 10,056 square feet of living space, and is located on 1.33 acres, bringing the outdoors in with natural wood and stone throughout the space. Each of the 5 bedrooms and 5 ½ bathrooms has a stunning open air, but private living area. The guests then asked CF for the story behind the exquisite antique Indonesian furniture and hand carved statuary throughout the property. CF gave credit to Jeanne Marie Imports for the original South East Asian decorative art and antiques. CF pointed to one golden carpet in a guest room and said, “That silk antique carpet is almost 200 years old. We created the interior design of this bedroom around that carpet. The headboard is part of a gate from an ancient Balinese monastery”. And so it went on with stories behind the collector pieces as the guests enjoyed learning of each artistic vignette in all of the rooms of the estate. Note: All of the furnishings and decor are being sold with the house. The caterers, while busy creating hand passed hors d’oeuvre’s for the guests, made it a point to inform me how much they enjoyed the well designed and spacious kitchen and butler pantry while preparing and serving during the open house. The bar tender liked the functionality of the space to serve from the outdoor bar area, while replenishing directly from the kitchen from the pass through window. Near the end of the party, many of us gathered on the lanai of the bedroom on the southern edge of the property and relaxed while we watched the sun set across the Ke’olu Golf Course, and ocean. The warm tropical breeze came down from Hualalai, the volcano in the distance, as the garden lights came on. This is where we all felt the true meaning of the estate’s name, Hale Ku Mana-House of Spiritual Healing. I will be holding open homes by appointment every Sunday, beginning on January 1st from 11am – 4pm if you would like to experience the beauty of this estate and perhaps call it home for yourself. I invite you to view the listing details and more photos of this unique private estate and call me directly for a tour or more information.